The Waterproof Bible stands up to full immersion and deep freezes, but when you're not on an adventure, it may look a bit out of place. Now you can dress up this rugged edition with heirloom quality covers, including this skirting leather option made by Gfeller Casemakers. When I wrote about the Waterproof Bible earlier this year, I imagined what it would be like if the imitation leather cover could be replaced by a beautiful skirting leather one like the Gfeller Casemakers cover on my beloved Seven Seas Journal from Nanami Paper. Not long after, Bobby Bardin got in touch to let me know that my daydream was about to become a reality. When we’d spoken over coffee late last year, the idea of Bardin & Marsee commissioning quality leather covers had come up. Bobby seemed interested, but was he interested enough to pursue the idea? Turns out the answer was yes. Bobby approached two shops revered for their craftsmanship, Gfeller Casemakers and One Star Leather Goods. 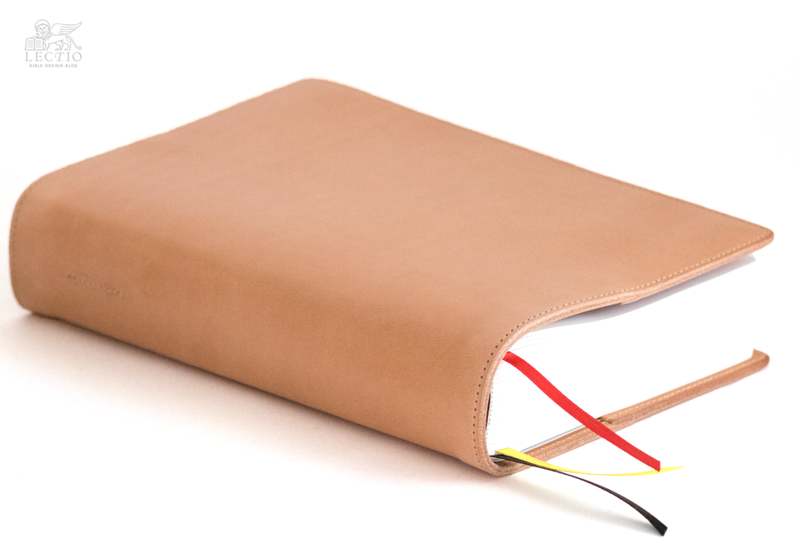 Each produced leather covers for the Waterproof Bible in their characteristic style. From Gfeller come two options, one in soft English Kip and another in sturdier skirting leather. Both come in a natural finish that darkens with age to produce a natural patina. While the kip warms up to a lovely tan, skirting leather has an orange undertone similar to British tan bridle leather. I love them both, but for the Waterproof Bible I chose the skirting leather, which is what you see in the photos here. I have always steered readers away from Bible covers, especially the type that used to be popular in Christian retail stores. In a nutshell, my objection was aesthetic. These carriers always struck me as a poor solution to the problem of toting a book along, encouraging over-stuffing. More than that, they tended to be plain ugly. Want to carry books and paper and pens around? Get a nice satchel instead. So why am I a fan of slipping the Waterproof Bible into a leather cover? After all, despite the sturdy construction of these covers, they seem to go against the spirit of the book’s indestructible ethos. You can bury your Waterproof Bible under the snow, forget it at the bottom of the pool, and so long as you remember where you left it, no harm done. Try that with a leather cover and the results won’t be as fun. The reason I like the idea of leather covers in general is that they can be made from a variety of skins not normally used in bookbinding, hides which acquire a beautiful patina over time. Your edge-lined goatskin cover will look fantastic out the box, and will improve with time, but it won’t utterly transform with use. 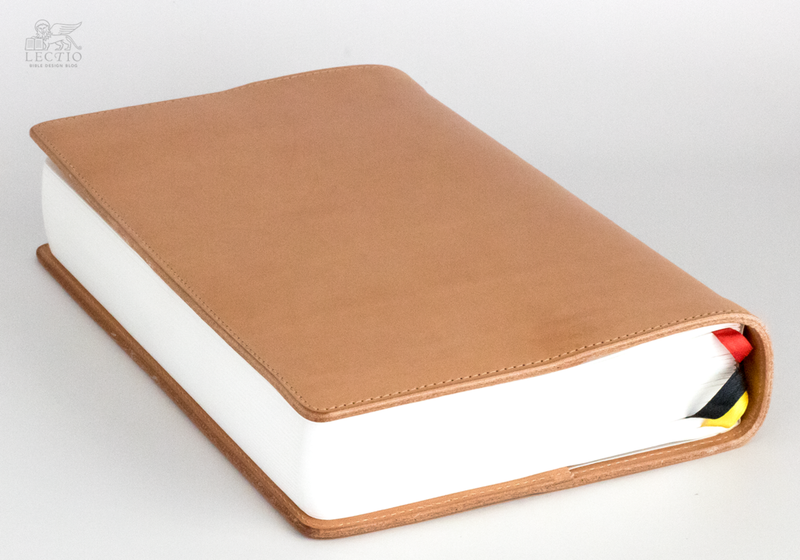 A cover made of natural veg-tan leather, however, will develop its own unique character. 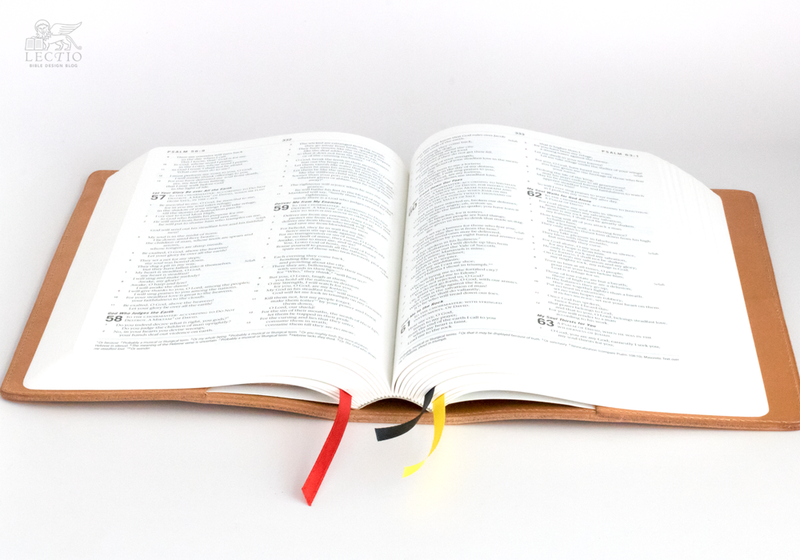 And if you sometimes want a change, instead of carrying a brown Bible instead of a black one, you could slip the same edition––with the same underlining and notes—out of the black cover into the brown. That’s the general argument, and here’s why the Waterproof Bible is particularly well suited to such a use: it is robust enough to pair with a cover without having to worry about durability. See, another reason I have always steered people away from Bible covers is that I worry about the effects of the added stress on those bindings. Dainty bindings and thin India paper may not play well with an aftermarket cover. In this case, the covers are made specifically for the Waterproof Bible, which is strongly-built so as to alleviate such worries. Above, you will find a photograph of the Gfeller skirting leather cover for the Waterproof Bible compared to various other leather goods by the same maker. The items at the center are skirting leather, and you can see they acquire an orange-tan luster. The pen case and notebook cover on the outer edges are kip, which mellows to a darker tan without the orange tones. Each of the covers retails for $150 from Bardin & Marsee. The imitation leather options are much cheaper. Practical as they are, though, they will never have the magic of these exclusive heirloom options. If the pure utilitarian appeal of the Waterproof Bible is what speaks to you, adding this note of luxury won’t make much sense. 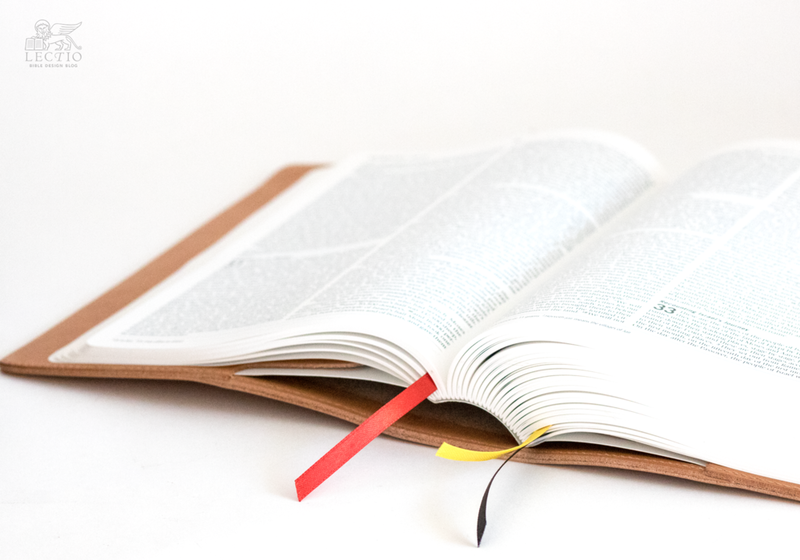 But if you appreciate the Waterproof Bible for its opaque paper, crisp text, and durability, then you might share my fascination with dressing it up in leather.